Solo-tuned diatonic Harmonica with corrosion-free stainless steel reeds (orchestra-tuning), ergonomic covers and carmine red plastic comb. 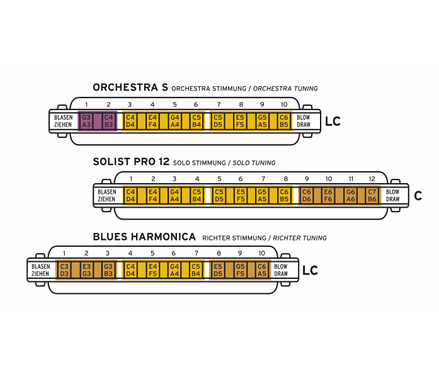 The ORCHESTRA S: We are excited to offer a ten-hole, solo-tuned harmonica (Orchestra-tuning)! As with the chromatic harmonica, all notes from the major scale are available throughout a two-and-a-half octave range. The ORCHESTRA S offers even more! Typically, the root note is found in hole 1-blow. The ORCHESTRA S places the root note at hole 3-blow, and half of the lower octave is added to holes 1 and 2. Since many players miss some of the notes on the standard Richter-tuned diatonic harmonica in the lower register the ORCHESTRA S allows them to hit the missing notes without having to apply a bending technique. The root note of the diatonic major scale is marked on the coverplate - it starts in 3 blow. This makes the ORCHESTRA S an ideal soloing instrument; the ten-hole design makes the Orchestra-S compact enough to take your melodies anywhere! The note layout is basically the same as that of a chromatic harmonica, making the ORCHESTRA S a great starting harmonica for learning to play a chromatic. The compact size combined with SEYDEL's durability makes the ORCHESTRA S a good choice for musical education in schools. The ORCHESTRA S opens new possibilities to blues harmonica players by making it easy to play minor pieces (3rd position) with a sound similar to solos played on a chromatic, thanks to the solo-tuning. They will also appreciate the extended major scale in the lower register. The root note of the dominant chord is available in the hole 1-draw, making it similar to playing in 2nd position on a standard Richter-tuned harmonica. Seasoned blues players will find all the notes of the blues scale through natural notes and bent notes, bringing soul and color to their blues improvisation. I use it at home as an improving beginner. Have recommended product and company to friends. Will shop with Eagle music again. The harmonica has a really good full sound and being solo tuned it is great for playing melodies (does not have the missing notes of a blues harp. Have had great fun playing this since receiving it. Great for harpists playing melodies, film tunes, classical music.Smaller version of a chromatic perhaps?